What makes your ideal beach day? It might be packed with tropical cocktails on exotic white sands, or a watersports adventure for those who can't sit still. Perhaps you're longing for something completely different? Like a black sand beach with mountain views or a rusting shipwreck in a secluded bay. Perhaps an island ticks your boxes, with loads to explore as you drive along the coast? There's no one size fits all approach when it comes to finding your best beach holiday destinations – it's all about what floats your boat. We've put together a guide, introducing some of our sandy favourites. Can we tempt you for a day at the beach? For sheer choice visit Antigua, where locals proudly proclaim that there's 365 beaches – one for every day of the year! Narrowing down which stunning shore to visit is a nice headache to have. 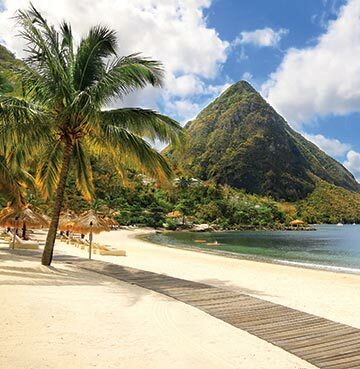 If it's always views that you choose, get a peek of the Pitons from many of St. Lucia's sands. Jamaica is the jack of all trades, mastering them all with a relaxed ease that must come from the friendly locals. The island's got you covered whether you want beach parties, watersports or quiet coves. For natural beauty it has to be Barbados, home to pink-tinged sands, luscious palms and towering limestone cliffs. Beaches here always seem to be bordered by beautiful nature. With 800 miles of coastline, the Dominican Republic is the beach lovers' wildcard – perfect if you're not quite sure which type is your favourite. Dabble in watersports, lay back and enjoy tranquillity or admire the views with a cocktail in hand – you'll be spoilt for choice in this Caribbean gem. How can these three islands be so popular, yet their shores remain so untouched? 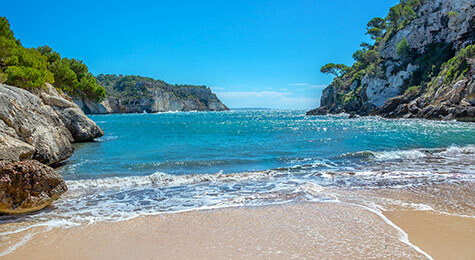 We're not sure either, but before we get lost in this Balearic beach riddle, let's just stop to appreciate what this means for us – pristine sands that aren't as crowded as you might think. If it's a family beach holiday you're planning, it might be time to stop looking! Towering cliffs shelter bays from strong winds and sand slopes gently into calm, shallow waters. Plus, there's plenty of beaches where watersports, activities and restaurants take pride of place on the sand. We know how hard it can be to keep those active little 'uns amused. Like its beach holiday destination counterparts, Greece and its islands tick all those idyllic boxes. White sands, turquoise waves and jaw-dropping scenery are commonplace here, but it's when you dig a little deeper that you find some truly iconic beaches. Behind the towering limestone cliffs Zakynthos' Navagio Beach hides a rusting shipwreck that ran aground in the 1980s. A truly unique sight as you arrive by boat, so be sure to grab a snap of this rusting beauty against its brilliantly white backdrop. From white to pink on the glorious island of Crete, where the sand of Elafonissi Beach charms with its stunning salmon-tinge. Crushed shells give it a unique pink shade and offers another unmissable photo opportunity. 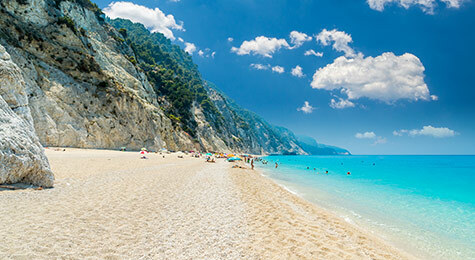 Feel like a Hollywood star on Kefalonia, home to one of Greece's most A List beaches! Fans of Captain Corelli's Mandolin will recognise the beautiful Myrtos Beach, a golden sand rose between two rocky mountain thorns. It's a similar story on Lefkas, where Porto Kasiki lies beneath the sheer cliff face. You'll get neck ache trying to stare all the way to the top, so perhaps it's better to kick back and enjoy the view out to sea instead? Rhodes' St. Paul's Bay has a religious history, commemorated by the small church dedicated to the saint himself. It's also incredibly beautiful, with a perfect circle of sea sitting between beach and rock. The mainland's no slouch either! Close to Peloponnese you'll find Golden Beach, an immaculate strip of sand that separates the sea from Gialova Lagoon. A stunning sight, the sand here is a golden line dividing two beautiful shades of blue. Mountain scenery never seems to be far away when you rock up to Bodrum and Dalaman beaches. So you're almost guaranteed an amazing view, wherever you choose to set out your towel – that's one box ticked! Your next decision will be whether you want some natural beauty or bars and restaurants in easy reach. If it's the latter, there's just a short stroll between bar stool and beach chair on the likes of Gumbet and Bitez. Craving that back to nature vibe? Loggerhead turtles head to Iztuzu and Cirali to nest each year, so who knows if you might spot some adorable little hatchlings on your beach day! The cream of the Turkish crop has to be Oludeniz, home to a mesmerising blue lagoon and towering mountains sitting just behind the golden sand. So many Algarve beach lovers have been there, done that and got the tan – and yet they keep coming back year after year! The coast here must truly be something spectacular. Known for its majestic golden cliffs and craggy rock formations that sit out at sea, beaches here are effortlessly beautiful. Their scenery gives each a degree of familiarity, but the charm of the Algarve is that's there something for every kind of beach baby. Long stretches with plenty of space will appeal if you're heading away with the family. The Blue Flag beaches of Praia de Ancao and Praia do Martinhal combine facilities like sunbeds and shades with thrilling watersports like water-skiing. The waters here are calm and a lifeguard presence gives you that extra peace of mind. When it comes to quiet coves hidden away behind the cliffs, you just can't beat the Algarve! Some are so well secluded that you'll need to know they're there – not even passing cars can pick out these gems. 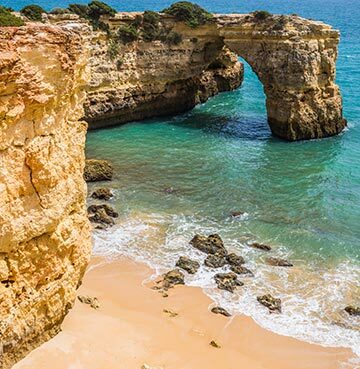 Praia de Marinha and Albandeira are two of the coast's most iconic, their no frills nature ensures that cliffs, caves and sand are the stars of the show. So sit back, relax and enjoy the tranquillity. If you're craving something out of the ordinary, look no further than Praia do Barril – home to a graveyard of anchors that marks the area's tuna fishing heritage. Praia de Tavira has an air of the exotic, a long stretch of tropical that stretches out from the Ria Formosa Natural Park. Cyprus has never been an island that conforms, a trendsetting country that isn't afraid to break from tradition. And it's no different when it comes to the coast! 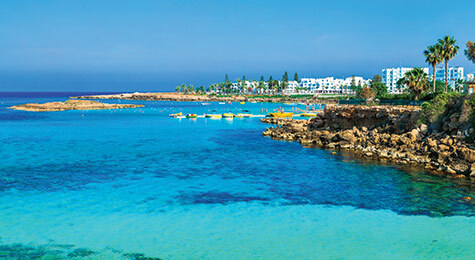 While many beach holiday destinations have themes and similarities between its coves and bays, Cyprus offers an eclectic and unique collection. Pebbly Petra tou Romiou has an intriguing past, as the supposed spot where Aphrodite emerged from the sea. Marked by a rock sitting just offshore, rumour has it that if you swim around three times you'll find true love. Lara Beach is a protected breeding ground for nesting turtles, giving it a back to nature vibe that holds its own charm. Porto Pomos is wild and rugged, offering amazing scenery and blue sea that's too tempting to resist. You'll find yourself taking a dip in no time! Sirena Bay is a loved by locals favourite, so you won't find many holidaymakers heading for this tiny stretch. A quirky looking beach bar is the only facility, so grab a drink and enjoy the sound of local chatter. This feels a lot more like the real Cyprus. Paramali Beach is all set for thrillseekers, as one of the island's best for kitesurfing. So you can either sit back and admire the experts, or get out there and give it a go for yourself. 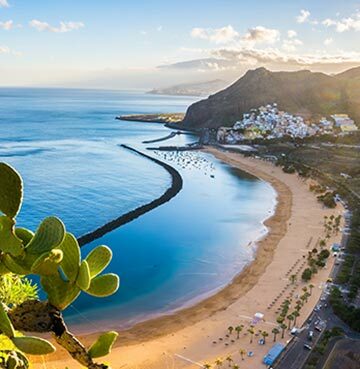 We might have been waxing lyrical about the variety on offer in some of our beach holiday destinations, but the Canary Islands are probably the very best for this. This is where jaw-dropping beaches sit in stunning nature reserves, like the beautiful Papagayo on Lanzarote. Corralejo and Maspalomas back onto the undulating sand dunes, a truly one of a kind experience. Stunning desert-like beach days could be all yours on Fuerteventura and Gran Canaria. Tenerife has an impressive selection of black sand beaches to choose from, with plenty offering views of the island's towering mountains. Although you will find volcanic shores on its neighbouring Canary Islands, so these aren't just Tenerife exclusives. And the Atlantic breeze makes every island an ideal watersport destination, so surf's up for all you adrenaline junkies.